For those who want to become a certified medical examiner, here’s NRCME Training Course that helps you to test commercial vehicle drivers. NRCME Training Course is a training system for the medical officers to be eligible for being medical examiners for the commercial vehicle drivers. This is a self guided online course that does not have any time limit to complete the course. The whole course is of only 12 hrs but the candidate can take their own time to complete the course. This course makes the candidate qualified to appear for the FMCSA’s examination for the NRCME Certification. Completing and passing this course does not make anyone eligible to be a medical examiner but only to qualify for that certification examination. This NRCME training course will provide a certificate of completion that is valid for a year from issuing, for the certification exam. A certified medical examiner will do the physical test of the commercial vehicle drivers to make sure that they are fit to drive on the highways without the risk of any medical conditions that can cause any crashes, injuries or other fatalities while driving. Since the commercial vehicle drivers have some specific physical demands to be fit enough to drive and these demands are not known to normal medical professionals. Only this NRCME training course explains these requirements making them aware about what to look for what are of importance. These medical examiners give importance to safety that can possible save numerous lives every day. NRCME training course is accredited by various medical associations and also get some credits for these medical professionals on the certified medical examiner. The increasing number of commercial vehicle drivers also demands for more number of medical examiner. The NRCME training course is important to know everything that needs to know about commercial vehicle drivers. What should be their physical conditions and what all conditions should be taken into consideration while certifying them to be fit and fine for driving. An average truck driver may be above the age of 40 with a few bad habits and mostly overweight with poor eating habits. They are most vulnerable to be less fit and healthy to be qualified. They are more at the risk of having cardiovascular problems. In order to identify the less healthy to be driver, the certified medical examiner should be well versed about the requirements that the NRCME can do. A driver should meet the Federal physical qualifications that only a certified medical examiner can determine. The list of the certified medical examiners, who have passed the certification exam, is available at the FMCSA registry. The commercial vehicle drivers should approach anyone of them and have the medical examination done. The importance of these certified medical examiners also lies in the fact that it is not just the public who deserve safe driving on the highways but also those commercial vehicle drivers, who has the right to be certified by a qualified medical examiner. The NRCME online training course is easy and simple. Just follow the following steps, complete the course, get the certificate of completion, and appear for the examination for medical examiner. The process is to get a medical license > Obtain the National Registry number > complete the course> get the certificate> appear and pass the examination to be a medical examiner. There are only two authorized examination center for the certification tests. The course is available for individuals or for a group. The individual will have access to the online course anytime after the purchase. The course includes 27 modules provided in PowerPoint format with pre-tests and post-tests and quizzes. There is also access to the online library for any references. For the group training the course can be tailored to fit the practice needs of the individuals with multi view reporting. Each of the individual in the group will have separate registration and training history. The accessibility is easier. The training will be conducted for the group but the tests will be done individually. The online nature of the training makes it possible to create a group for the training that has individual members scattered across the country. NRCME study guide is very much credible with a history of 95% candidates passing the medical examiner certification on the first attempt. The NRCME training online course is intense with more than 500 questions and answers that will practice the individuals. The NRCME training course is written by experts in the medical field with each of the 27 modules focusing on one of the medical condition or part. 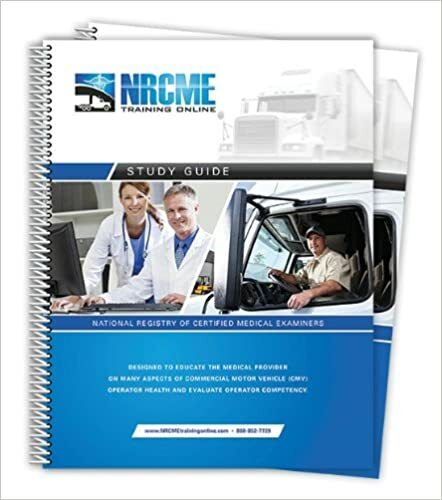 NRCME meets all the FMCSA requirements and will enhance the certified medical examiner’s ability to determine if a driver can handle the mental and physical demands of the driving a commercial vehicle, safely.